A SpaceX Falcon 9 rocket lifts off from Cape Canaveral Air Force Station in Florida just before dawn on June 29, 2018. Loaded on top of the rocket is a Dragon cargo spacecraft that will deliver supplies to the International Space Station. Skywatchers who woke up early to see a SpaceX rocket launch from Florida today (June 29) were treated to quite a spectacle as the Falcon 9 rocket blazed into the predawn sky, and the photos they captured are jaw-dropping. Topped with a used Dragon cargo spacecraft, the Falcon 9 rocket lifted off from Cape Canaveral Air Force Station at 5:42 a.m. EDT (0942 GMT) on a mission to deliver 5,900 lbs. (2,700 kilograms) of supplies and science gear to the International Space Station (ISS). As the Falcon 9 hauled the Dragon into low Earth orbit, the rocket's flames created an enormous, glowing halo in the morning twilight. 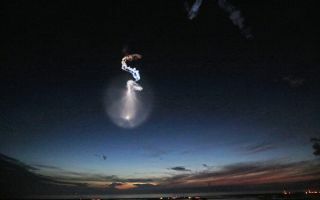 "These pre-sunrise or post-sunset launches give for a spectacular show in the sky," Jessica Jensen, director of Dragon mission management for SpaceX, said at the news conference. "Basically, what's happening is, it's still dark outside, but you have the sun illuminating the plume as it's in space," Jensen said. "I like to refer to it as the space jellyfish that's coming down after us." Retired NASA astronaut Nicole Stott captured this photo of SpaceX's Falcon 9 rocket as it launched a used Dragon cargo spacecraft to the International Space Station on June 29, 2018. Retired NASA astronaut Nicole Stott caught that "space jellyfish" on camera while watching the launch from Cape Canaveral Air Force Station. "Just wow!" Stott tweeted. Trailing behind that space jellyfish, the rocket's zigzagged exhaust plume looked like the scaly body of a dragon in this close-up view by Twitter user Jessica Hellein. "Even the exhaust looks like a Dragon," she tweeted. Michael Seeley, a photographer and co-founder of WeReportSpace.com, captured a long-exposure shot from the Vehicle Assembly Building (VAB) at NASA's Kennedy Space Center, which is located about 10 miles (16 kilometers) away from the launch site at Cape Canaveral. "Stunning sunrise launch of the SpaceX CRS15 Falcon9 as seen from the roof of the VAB," Seeley tweeted. While the view from the ground was pretty cool, some lucky airline passengers may have had the most incredible view from up in the stratosphere. While on a flight from Puerto Rico to Orlando, Florida, Twitter user @unnegroahi captured more than 20 photos of the Falcon 9 rocket as it made its way into orbit. At Orlando International Airport, where his plane was getting ready to land when he captured the images, other launch spectators were taking photos from the runway. Editor's note: If you captured an amazing photo or video of SpaceX's Falcon 9 rocket launch and would like to share it with Space.com for a story or gallery, send images and comments to spacephotos@space.com.